This recipe has been in my file to post for a while now, along with some others. Lots going on this summer and not enough time to do everything. We had these Kabobs back when I posted the Grilled Summer Vegetables and they were super delicious. Pork steak is one of Jim's favorite meat's to grill, so I decided to trim any excess fat and cut it up in large cubes to grill along with his other favorite -- Kielbasa Sausage. 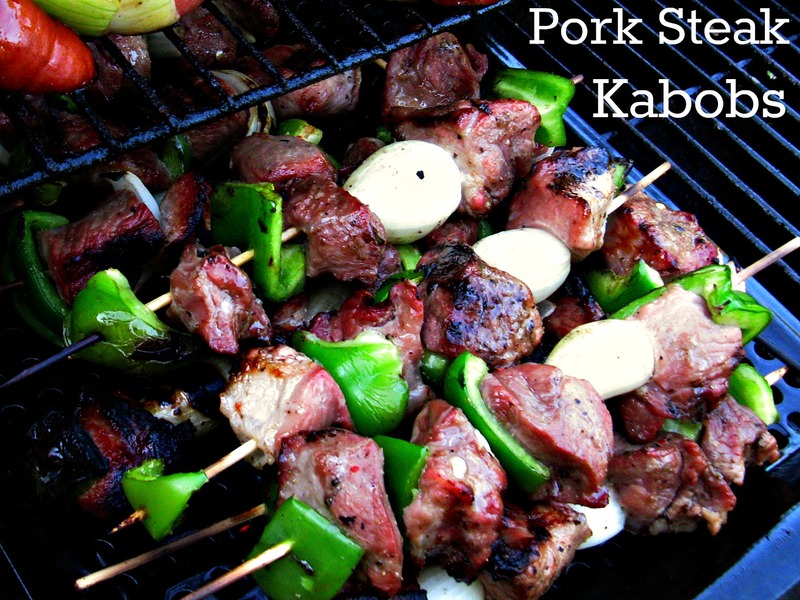 Pork Steak Kabobs are easy to prepare, and pair well with most any vegetable. This time, I kept it simple and paired it with some bell pepper and onions that I cut the same size as the the pork steak cubes. This way, they have a better chance to cook evenly. 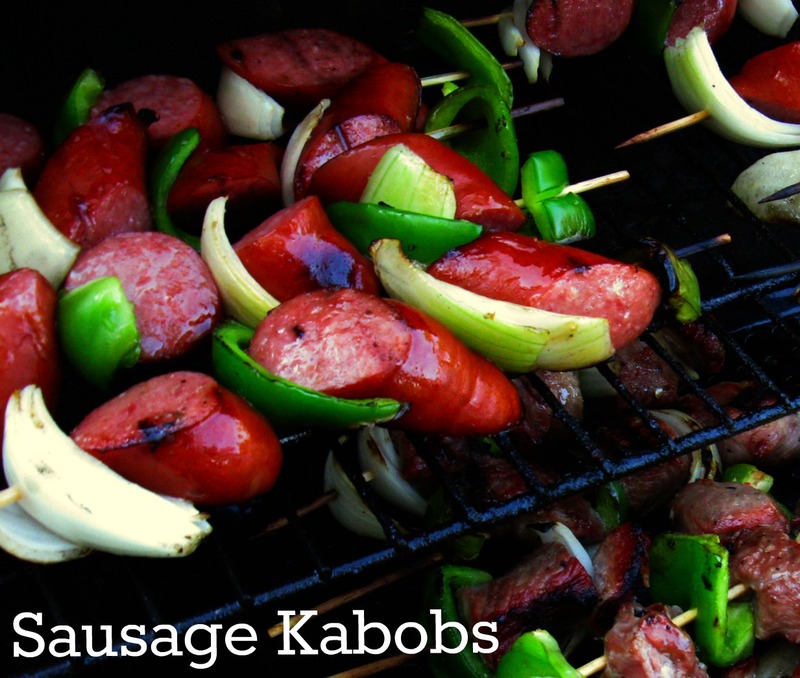 Sausage Kabobs are super easy to prepare for the grill, because there is no trimming involved. Just cut them in large links and slide them on the skewer with the vegetables. I baste them with the same mixture I used on the Grilled Summer Veggies. These Kabobs were not only delicious, easy, and quick to make...they were fun to make. Invite your children, or like me, your grandchildren, to join you in the kitchen for some fun! Soak wooden skewers in water in a shallow dish for 30 minutes or until completely soaked. Toss Pork steak cubes, kielbasa sausage, and vegetables in seasoning mix. Spray skewers with a non stick cooking spray and then slide meat and vegetables on skewers, alternating each. Preheat grill for 5 minutes. Mix olive oil, butter and Worcestershire Sauce; set aside. 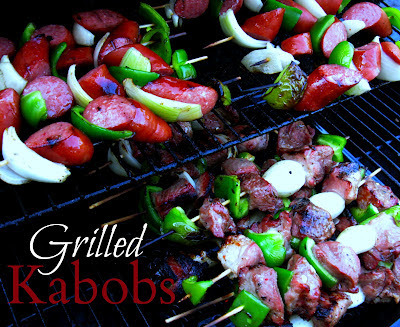 Place kabobs on the grill with light to medium heat, cooking for 5-7 minutes basting with olive oil and butter mixture. Turn kabobs and grill for another 5-7 minutes and baste again with olive oil and butter mixture. Remove from the grill and season with salt and pepper. Join the fun here for a linky party!